Summary: Death in the City of Light is the gripping, true story of a brutal serial killer who unleashed his own reign of terror in Nazi-Occupied Paris. As decapitated heads and dismembered body parts surfaced in the Seine, Commissaire Georges-Victor Massu, head of the Brigade Criminelle, was tasked with tracking down the elusive murderer in a twilight world of Gestapo, gangsters, resistance fighters, pimps, prostitutes, spies, and other shadowy figures of the Parisian underworld. Try to imagine a crime spree in Nazi-occupied Paris during World War II that would rival the ruthlessness of the Nazi occupation. That’s exactly the story David King tells in DEATH IN THE CITY OF LIGHT. It is the story is about one of the most notorious mass-murderers in French history. In March, 1944, neighbors reported foul smelling smoke coming from a town house in Paris. When the police and firemen arrived they found a haunting scene of skulls, bones, dismembered body parts and partially burned corpses. The owner of the town house was Dr. Marcel Petiot, a very handsome and charismatic physician. A lengthy investigation led the police to a very bizarre finding. Petiot, while posing as a French Resistance fighter, would offer individuals safe travel out of Nazi-occupied Paris to South America. But rather than provide safe travel, Petiot would murder them, get rid of the bodies and keep their money and valuables. The police captured Dr. Petiot after an eight month man-hunt and charged him with twenty-seven murders. The man-hunt and investigation led the police to some very strange places in Nazi-occupied Paris. The trail traced Petiot through a mental institute and a Nazi prison, to the Paris underworld with its gangsters and prostitutes and to the French Resistance. The trial began in March, 1946, two years after the gruesome discovery at Petiot’s town house. The combination of the French judicial system and the brilliant tactics of Dr. Petiot, the chaotic trial became a circus. After all the drama, Petiot was found guilty of murder and died at the guillotine. Many questions remained unanswered such as how did he actually kill the victims and what did he do with the money and valuables. Author David King speculates on some logical answers in the Epilogue. In addition to telling the story of a mass-murderer, King gives the reader a glimpse of Paris during the Nazi occupation. It’s always amazing to me how some people not only survive wartime but actually take advantage of the situation, like Dr. Petiot, to benefit them, usually at the expense of others. The story reflects King’s thorough research as he utilized detailed trial material and police dossiers previously not made available to provide vivid detail into the investigation and court proceedings. 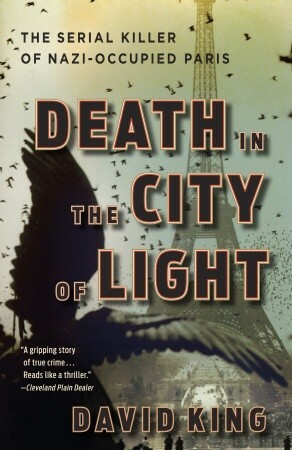 DEATH IN THE CITY OF LIGHT is a combination of history and true crime and reads like a thriller. It is another example that truth is often stranger than fiction. I recommend this book to anyone who likes a good thriller or has interest in French World War II history. Thanks to Booking Pap Pap for his terrific review and thanks to the publisher for providing a review copy. I agree - terrific review! I think the story would scare me though - I like my serial killers to be make believe! He's sold me too!! A true crime story set in Paris during World War II? Count me in! I think this is well reviewed and sounds great. I'd read this one for sure. Wow!! I had no idea. I like true crime, even though it sometimes freaks me out. Add me to the list of those convinced to read this book. I'm not a true crime person, but this seems to incredible to miss. Thanks for the recommendation. This one sounds really interesting. I will have to give this a try!